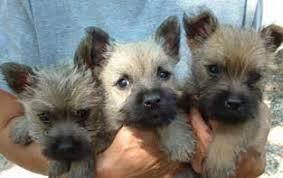 The Cairn Terrier is one of the oldest terrier breeds and originated in the Scottish Highlands and were used by farmers, crofters and shepherd for pest control such as foxes, rabbits, badgers and rats and mice . The name came about due to the dogs main function which was to chase prey between the cairns in the Scottish highlands and for sporting. They are well known for their 'gameness' and the ability to ignore pain and keep on going. An interesting point is that they are predominately left pawed. It is believed that dogs that tend to be left pawed, are usually far better in any task related to scenting. 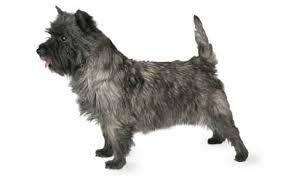 The British breed club’s motto, “The best little pal in the world,” describes the true nature of a Cairn Terrier today. Although this breed is extremely friendly, they are also full of beans and a daily walk is necessary. They do not do well being left alone and are prone to separation anxiety, so early training of Alone Time training is a good idea. They can be stubborn and rather bossy (as with many working dogs as they are bred to be independent), so training can be a bit of a challenge. Only positive reinforcement methods should be used, with plenty of praise being given. Being terrier they are prone to chase and also to dig. A good idea is a digging pit which is stocked daily to keep them busy, which will safeguard your garden, especially if the dog is bored or frustrated. They can be reactive towards other dogs, so early and continued socialization is necessary and one must be careful with them when meeting new dogs - always on neutral territory. As with many of the other terrier breeds, they do tend to be barkers, especially when hearing noises and when people arrive, when left alone as well. It is a good idea to train the dog not to bark, on cue when it is still young. On average the Cairn Terrier is not particularly friendly towards other dogs, regardless of their size. It is far better to bring the Cairn into the home environment as a pup. This breed can be really scrappy with other dogs, but will co-exist with them more readily than some other terriers. However, strange animals may be a different story. ​This dog was bred to hunt and will go after anything that moves, regardless of the size, so small animals around is not recommended. Though they make love family dogs, small kids and the Cairn are not a good match. They are not known to be patient and small children may annoy them to the extent they may last out. Allergies, Globoid cell leukodystrophy (a hereditary disease), atopy, cataracts, congenital polycystic liver disease, cryptorchidism, globoid cell leukodystrophy, Legg-Calve-Perthes disease, ocular melanosis, patellar luxation and PRA. Do continue the socialiazation - keeps solid social skills in place and as this breed can be reactive to strange dogs, must be ongoing. Give daily, regular exercise which this breed really needs.